The anemone plots at Old Stairs consist primarily of the colonial anemone, Anthopleura elegantissima rather than the solitary anemone Anthopleura sola (note that these were considered a single species prior to the past several years and they are not distinguished in our sampling methods). These plots showed greater variability due to sand inundation from their inception in 1994 through 2002, and more gradual change thereafter with cover ultimately declining from 70% to around 40% up to 2012. Anemone cover has increased a bit more recently. As anemones declined, invertebrate species (primarily Phragmatopoma and encrusting tunicates) and red algal species (namely Chondracanthus sp. and filamentous species) have taken their place, with each of these groups increasing to a mean cover of around 20%. Each of these plots has a unique ecological story to tell. One has a recurring colony of Phragmatopoma that grows for a period of time and then gets broken away, another has persistent colonies of both sponges and tunicates, along with recurring Egregia holdfasts which have periods of growth and senescence. Two others have persistent patches or red algae and mussels respectively, and the final plot has remained nearly covered by Anthopleura despite partial sand burial from time to time. The barnacle plots at this site consist of a mixture of Chthamalus dalli/fissus (note that species were not distinguished until 2001) and Balanus glandula with the former being the dominant component of all plots. Since their inception, barnacle cover declined from nearly 100% in 1994 to less than 20% in 2010. Barnacle cover rebounded a bit after that, but was back down to 25% as of fall 2014. In fact, a single plot, which has remained at nearly 100% barnacle cover throughout the years, is responsible for most of the remaining cover. The other four plots have become dominated by Endocladia, Mytilus, or a mixture of these two species along with bare rock. Motile invertebrate counts at this site began seasonally in the fall of 2000 and were changed to annual sampling in 2004. Littorines were added to the protocol in the fall of 2001. 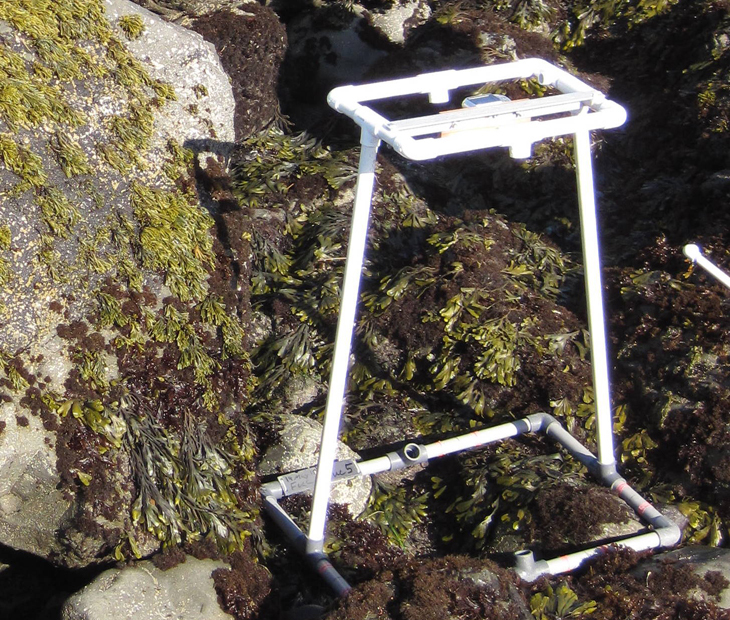 Within the barnacle plots, littorines and limpets are both highly abundant with the former varying in the neighborhood of 1000 individuals per plot and the latter steady at around 100 per plot. Nucella spp. snails are also common with around ten individuals per plot in most seasons, though these were absent during three sampling events. Shortly after site establishment, the mussel plots exhibited a precipitous decline in mean Mytilus cover from around 80% in spring 1995 to near 30% the following fall. This decline was met by a corresponding increase in barnacle cover along with bare rock. After that, mussels began a gradual recovery interrupted by brief declines of varying degrees. One of these subsequent declines occurred in 2004-2005 the other in 2009, and both were the result of breakouts in the mussel beds, presumably due to heavy winter storms. A smaller decline was seen in fall 2014 with cover decreasing close to 50%, again due to storm-related mussel breakouts. Consistent recruitment of young mussels to this site has allowed these mussel beds to regenerate before other opportunistic species could become established in the plots. The data from the motile invertebrate sampling show consistent low levels of chitons (Nuttalina spp.) and littorines in these mussel plots, along with higher and more variable numbers of whelks (Nucella spp.). In addition, limpets have been quite abundant and highly variable in these plots since the spring of 2002. The Endocladia plots at this site are a mixture of turfweed, barnacles, mussels, and bare rock with no clear patterns developing throughout the monitoring period. Mean Endocladia cover has varied between about 10 and 50%, barnacles have varied more dramatically between 20 and 60%, and mussels have remained steadier at around 10 to 30%. The data from the motile invertebrate sampling show consistent low levels of chitons (Nuttalina spp.) and whelks (Nucella spp.) in the Endocladia plots, along with higher and more variable numbers of limpets and littorines. Rock ("Above Barnacles") plots were added to this site in the fall of 2008 to document any upward spread of intertidal species as a result of global climate change or other factors. These plots are expected to remain dominated by bare substrates unless barnacles or other species begin to encroach upon them. Barnacles have been observed within these plots since their inception, though their percent cover has remained low. Increased barnacle recruitment was observed in fall 2012 and barnacles have remained common in some plots since that time. Data were not collected in these plots during the spring of 2010. Littorines have been common in most of these plots since their inception. Sea star (Pisaster ochraceus) abundance within the original transect swaths began at around 30 total stars and remained below that level for the first 5 years of sampling. After 2000, the numbers of stars began to increase and become more variable, both through time, and seasonally (with higher numbers in the spring compared to fall). In the spring of 2004, the push for methodological consistency among sites prompted the addition of a series of three large irregular plots to be sampled in addition to the transects. These data show a high number of stars (over 200) during their first few seasons of sampling, and then declines to less than 50 stars by 2012. Seastars are often observed to be partially or completely buried in sand near the base of the reef structures at this site. While other sites in southern California were starting to become affected by the seastar wasting disease as early as the summer of 2013 and we had documented disease related declines at sites upcoast and downcoast of this one, we never confirmed the wasting disease at Old Stairs. This site was deemed the last holdout with respect to the wasting disease. In the fall of 2014, however, while a similarly large number of stars were counted in the fixed plots compared to recent seasons, most of the larger individuals were gone and a large number of young recruits made up the difference. It appears that the disease did finally sweep through this part of the Malibu coast sometime between our Spring 2014 and Fall 2014 sampling events. A supplemental sitewide search for seastars was initiated during that latter sampling event. The size distribution figure shows that the population of seastars at Old Stairs is comprised of mostly larger individuals but with a fair amount of consistent recruitment (presence of stars less than 50mm). There are no clear pulses of recruitment that have moved through the population. 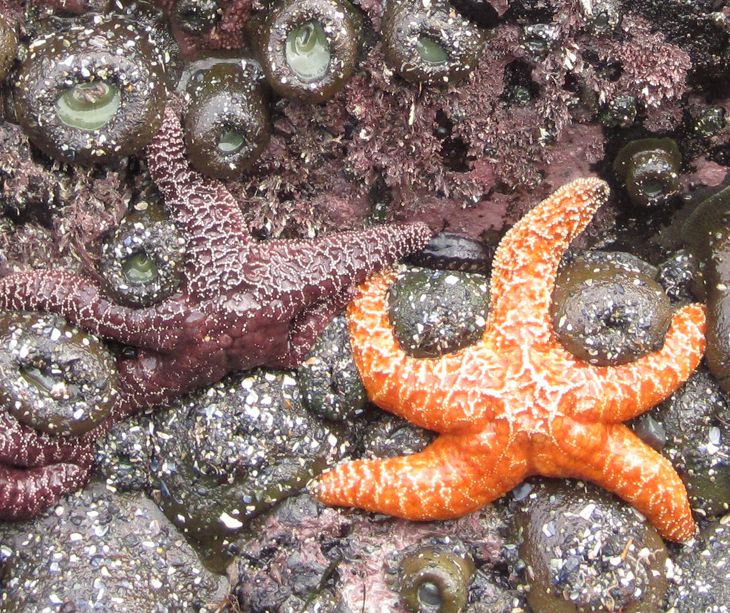 The seastar population at Old Stairs is likely maintained both through recruitment, and through migration to and from the subtidal.